This beautiful colourised snake bar set comes from China and was minted exclusively to be sold in the Asian Market. 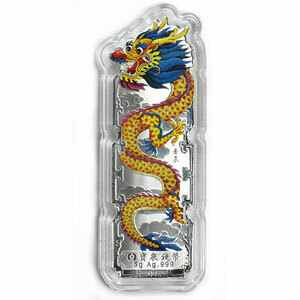 Each set contains five 10 gram bars minted from .999 fine Silver, each featuring a different colourised snake. The total Silver weight for the set is 50 grams. Each bar comes in a plastic capsule and includes a display stand. 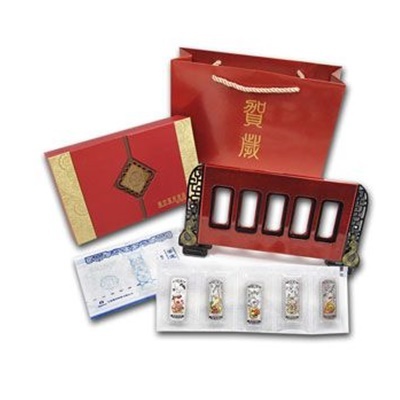 The entire set comes in a red presentation box and red gift bag with a numbered certificate of authenticity. In Chinese Culture, people born in the Year of the Snake (1917, 1929, 1941, 1953, 1965, 1977, 1989, 2001 and 2013) are generous, charming, analytical, independent, smart, and good with money. They rely on gut feelings, are hard-working and intelligent.